The Internet is making any piece of information or media we want accessible from anywhere with a connection. And with wifi hotspots everywhere, getting connected is becoming increasingly easy. All-in-one devices are even allowing us to get out Internet fix without a computer. You can go online with a cell phone or an mp3 player. Almost anything electronic is now becoming “networked“ or in some way capable on Internet connection. Since starting this blog, I have begun to do more and more online. Traditionally, I’m pretty skeptical about relying on things being online. I don’t like the idea of trusting my data to some company’s server. I like to keep my own hard drive backups of anything I create or use so I always have it and can access it. I’ve never had a problem with something being stored online, its more of a precaution for my peace of mind. But this is beginning to change. With more of my life being on the computer and more things being done on the computer I am beginning to learn that I can’t keep everything, there simply isn’t enough storage or any practical way to store everything. I now trust more of the unimportant things to the Internet servers and more of the media intensive files (i.e. music, TV shows, general entertainment) that take up too much space to begin with. The idea of everything being online is fairly new in our technological society. 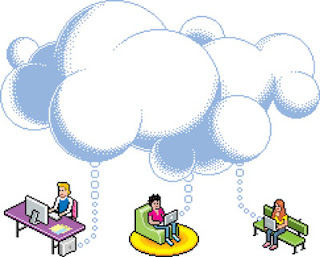 It’s referred to as “Cloud Computing.” The idea is pretty simple, everything you need is kept in the “cloud” (on the Internet) and you are able to access the cloud from any computer with a connection, no matter where you are. Its somewhat like creating a personal server. All the data and files you want are stored in a central location and no matter what computer you are on you can access this information. The major downside to cloud computing though, is that the central location is the Internet. That’s a massive central area. You can use a large variety of services to store you information and have it across multiple servers controlled by all different companies and people. This isn’t the most secure or smartest way to keep your data. Think of it as outsourcing your hard drive. You no longer control what is on your hard drive, it’s someone else’s data once it’s on their server. You are subject to their rule about the hard drive, usually presents in the terms and service agreement every website makes you agree to and almost no one reads. This lack of security and control over your data doesn’t stop many people from signing up for these services. The convenience of being able to access your information from anywhere at anytime and have a different company deal with the technical aspect is too appealing for many people to pass up. So where is the digital age heading in terms of information storage. People have already begun to make the shift from keeping hard copies of everything to keeping only digital copies on their hard drive. Now the shift if going from the hard drive to the Cloud (Internet). What’s next? Once cloud computing can be done in a much more secure manner and people grow used to it, where will we go from there. It’s hard to imagine another from of data storage that would be better than being able to access all your information from any device with a connection.